When preliminary designs for the third and final section of the High Line were revealed, the designers presented several options including flowerbeds and amphitheater seating for the Tenth Avenue Spur, an offshoot of the park that stands above the intersection of 10th Avenue and 30th Street. The design team’s aim is to make the Spur one of the main gathering spaces in the park. 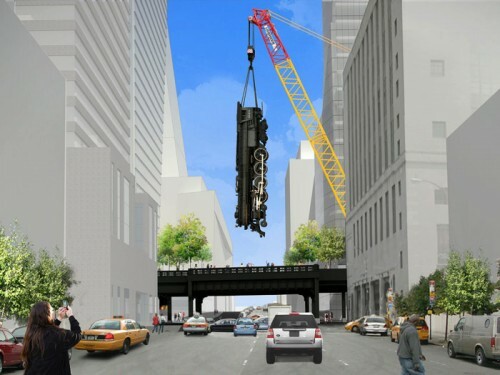 Now, with the proposal of a massive installation by artist Jeff Koons calling for a suspended locomotive over the park, the Spur may become exhibition space as well. 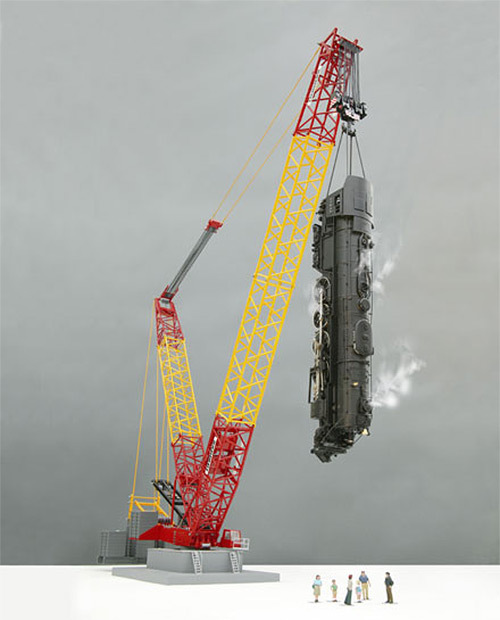 Koons’ Train, a full-scale replica of a 1943 Baldwin 2900 steam locomotive, would be suspended above the High Line by a crane. The sculpture would be constructed from steel and carbon fiber, weighing in at several tons. Visitors to the park could stand directly below the 70-foot-long sculpture and stare up at the locomotive as it spins its wheels, blows its horn, and shoots out steam several times daily. Train has some history with the High Line; there was an effort in 2005 to install the piece in a plaza at West 18th Street and 10th Avenue but the space available would not permit installation. In 2008, Director of the Los Angeles County Museum of Art (LACMA) Michael Govan began studying the feasibility of installing the piece in conjunction with LACMA’s expansion, and talks with the City of Los Angeles are ongoing. But while LACMA managed to haul a 340-ton rock from a mountain quarry through the streets of LA, it seems their Train may have left the station. Both the museum and Koons have expressed support for installing Train at the High Line regardless of the outcome in LA, so the possibility of a trans-continental Train still exists.